74 • RV PRO • November 2018 rv-pro.com D E A L E R S city, which is almost three hours northeast of Chesapeake. Row- land says he took over the lease on that property and turned it into American Family's third location. Although that site wasn't necessarily in the plans, it does sit right on the Interstate 95 corridor, halfway between Washington, D.C., and Richmond. "All of the very largest players in the industry are on that I-95 corridor from D.C. to Richmond. That attracts money coming in," he says. "I thought if we pick up the crumbs from them, we'd do very well." Acknowledging that the three dealerships are far-flung, Rowland says: "I did that on purpose. If you put your fingers together as a triangle, I can service the whole state of Virginia." 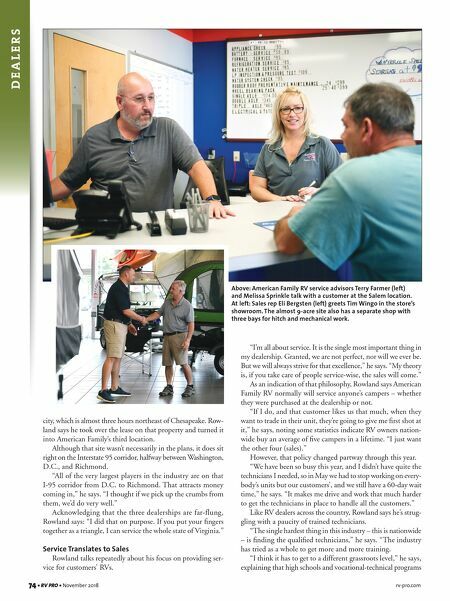 Service Translates to Sales Rowland talks repeatedly about his focus on providing ser- vice for customers' RVs. "I'm all about service. It is the single most important thing in my dealership. Granted, we are not perfect, nor will we ever be. But we will always strive for that excellence," he says. "My theory is, if you take care of people service-wise, the sales will come." As an indication of that philosophy, Rowland says American Family RV normally will service anyone's campers – whether they were purchased at the dealership or not. 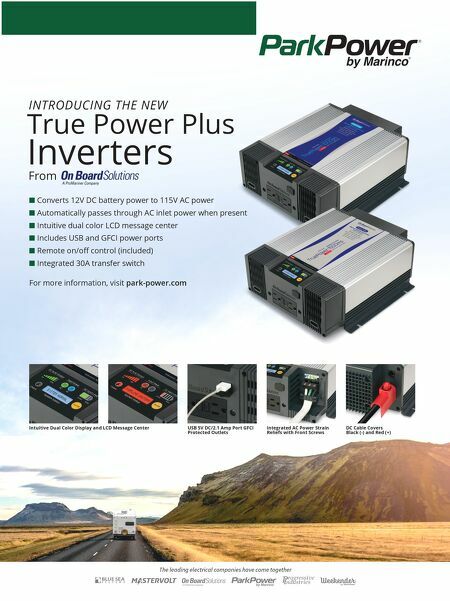 "If I do, and that customer likes us that much, when they want to trade in their unit, they're going to give me first shot at it," he says, noting some statistics indicate RV owners nation- wide buy an average of five campers in a lifetime. "I just want the other four (sales)." However, that policy changed partway through this year. "We have been so busy this year, and I didn't have quite the technicians I needed, so in May we had to stop working on every- body's units but our customers', and we still have a 60-day wait time," he says. "It makes me drive and work that much harder to get the technicians in place to handle all the customers." Like RV dealers across the country, Rowland says he's strug- gling with a paucity of trained technicians. "The single hardest thing in this industry – this is nationwide – is finding the qualified technicians," he says. "The industry has tried as a whole to get more and more training. "I think it has to get to a different grassroots level," he says, explaining that high schools and vocational-technical programs Above: American Family RV service advisors Terry Farmer (left) and Melissa Sprinkle talk with a customer at the Salem location. At left: Sales rep Eli Bergsten (left) greets Tim Wingo in the store's showroom. The almost 9-acre site also has a separate shop with three bays for hitch and mechanical work.